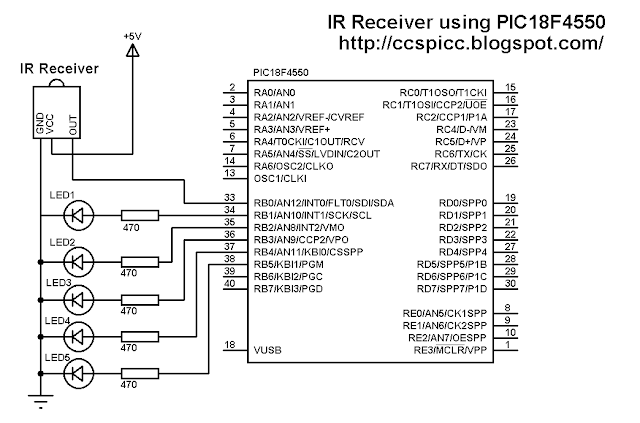 This topic shows how to build an infrared remote control transmitter and receiver using PIC18F4550 microcontroller and CCS PIC C compiler. The IR system has two circuits: transmitter circuit and receiver circuit. Both circuits have the same microcontroller type which is PIC18F4550. The RC5 protocol message is 14-bit data length which are 2 start bits, 1 toggle bit, 5 address bits and 6 command bits as shown in the following figure. The most important are the address and command bits. The IR signal needs a carrier frequency and the carrier frequency of the RC5 protocol is 36KHz with a duty cycle of 25% to 33%. The following image shows the transmitter circuit schematic of the IR system. There are five pushbuttons in the circuit, each pushbutton sends a different IR code via an IR transmitter. To get a carrier frequency of 36KHz, PIC18F4550 PWM1 module is used with 25% duty cycle. B5: address = 0 and command = 4. The two start bits are always 1's and the toggle bit maybe 1 or 0. In the receiver circuit there are 5 LEDs, each LED is controlled by one pushbutton on the transmitter circuit. 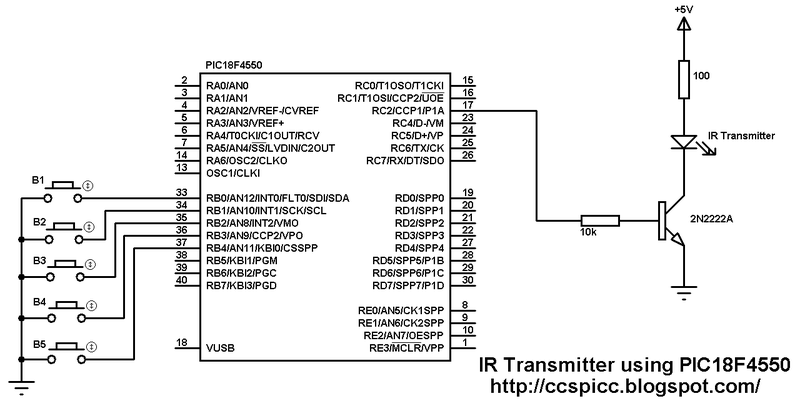 The IR receiver receives IR signals transmitted from the IR transmitter on the transmitter circuit. 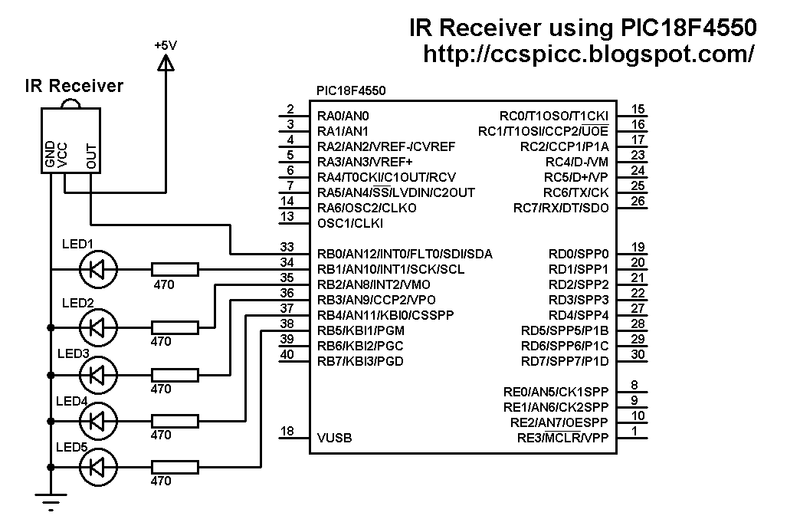 The microcontroller waits until an IR signal is received (RB0 pin goes from high to low). 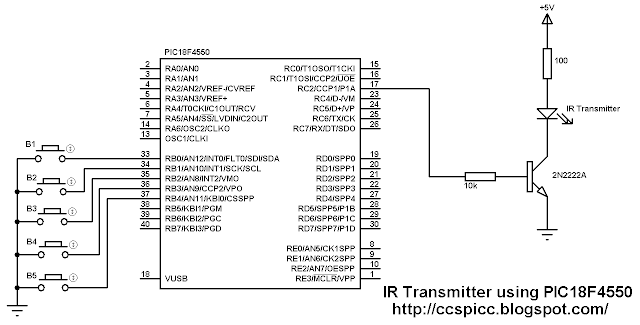 After an IR signal is received the microcontroller checks if the received signal uses RC5 protocol, if so the microcontroller starts decoding the RC5 signal and the most important are the address bits and the command bits. The following video shows a hardware circuits for the project. 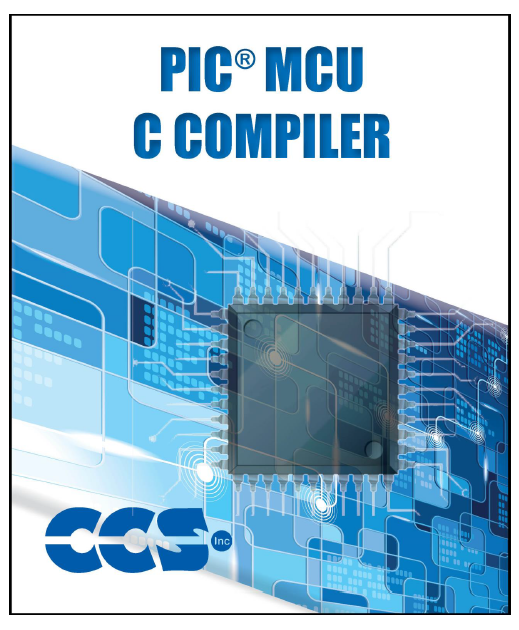 Now let's see how to drive a unipolar stepper motor using PIC18F4550 and CCS PIC C compiler. In the circuit there are 2 pushbuttons which are connected to RB0 and RB1 pins, they are used to choose motor rotation direction. PortB internal pull-ups are enabled in the software. 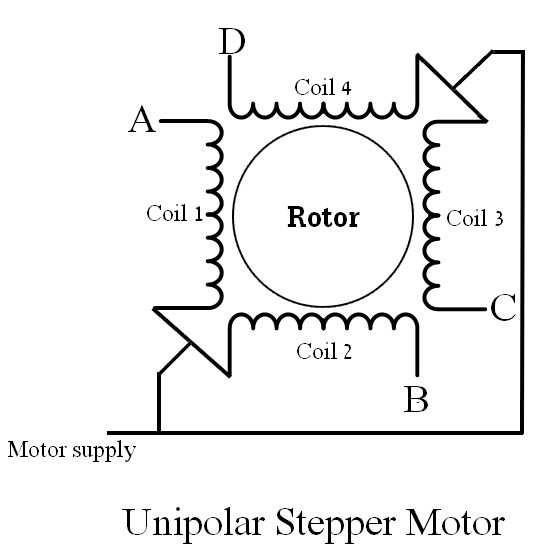 To control the stepper motor speed a potentiometer (10K) is used and it is connected to analog channel 0(AN0). 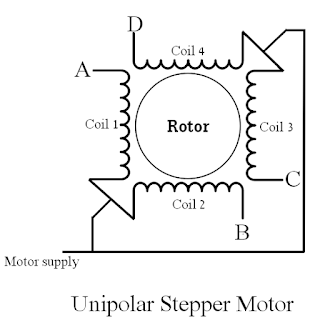 ULN2003 (or ULN2004) chip is used to energize the stepper motor coils. The ULN2003(ULN2004) is a Darlington transistor array which contains seven open collector Darlington pairs with common emitters. For stepper motor controller we need 4 transistors form this chip which means 4 inputs and 4 outputs are needed. Instead of the ULN2003 chip, another chip can be used which is L293D dual H-bridge circuits as shown in the circuit schematic below. For the L293D chip VS voltage always +5V and VSS voltage is the same as the motor voltage for example if the motor voltage is 12V, VSS should be connected to +12V power supply. PIC18F4550 internal oscillator is used (8MHz) and MCLR pin function is disabled. A pot connected to AN0 is used to control the speed of the stepper motor. 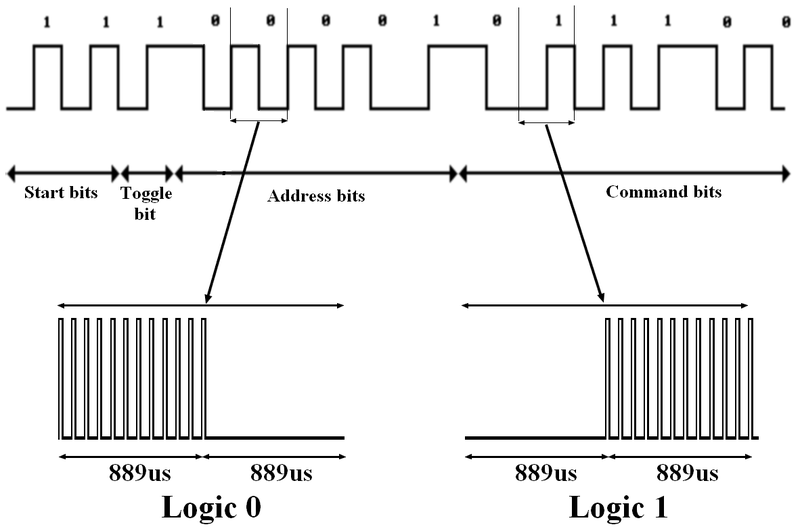 The microcontroller reads the analog data from AN0 and uses the digital value to change the delay between motor driving sequences. This post shows how to control speed and rotation direction of unipolar stepper motor using PIC16F877A microcontroller and CCS PIC C compiler. In the circuit there are 2 pushbuttons which are connected to RB0 and RB1 pins, they are used to choose motor rotation direction. For the L293D chip VS voltage always +5V and VSS voltage is the same as the motor voltage for example if the motor voltage is 12V VSS should be connected to +12V power supply. 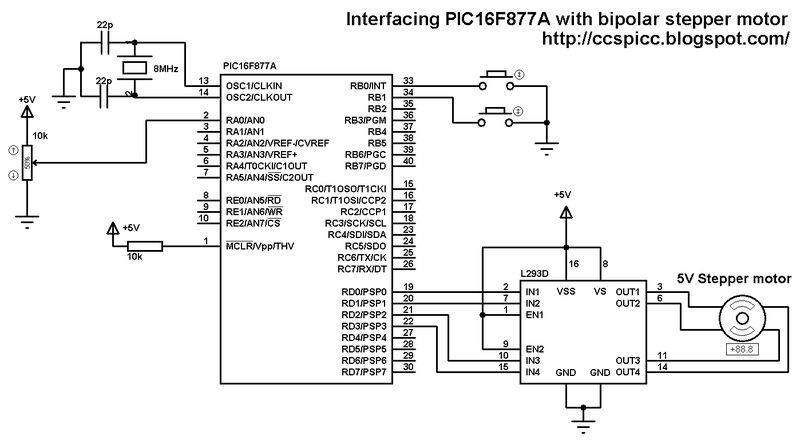 This topic shows circuit schematic and C code for interfacing PIC16F84A microcontroller with CD-ROM bipolar stepper motor. The following circuit schematic shows the connection between the microcontroller PIC16F84A and the stepper motor where a dual H-bridge circuit which is L293D chip is used between them. The two pushbuttons are used to choose motor rotation direction. The motor speed is fixed by the code but we can change it by changing the delay between the four phases. 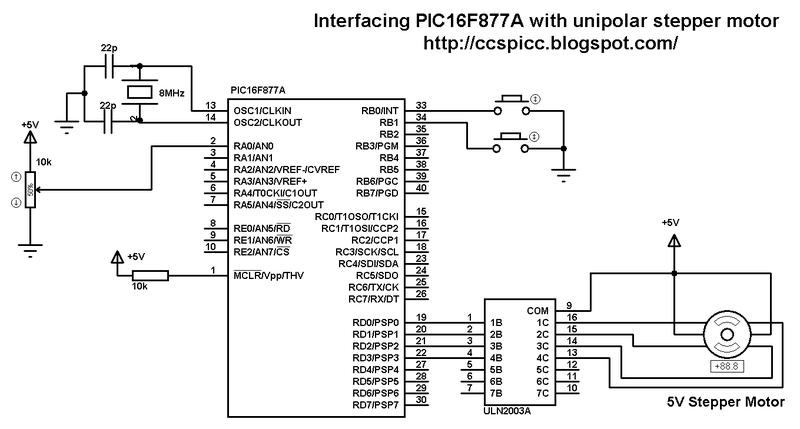 Interfacing PIC16F84A microcontroller with stepper motor video: The following video shows a hardware circuit of this project. 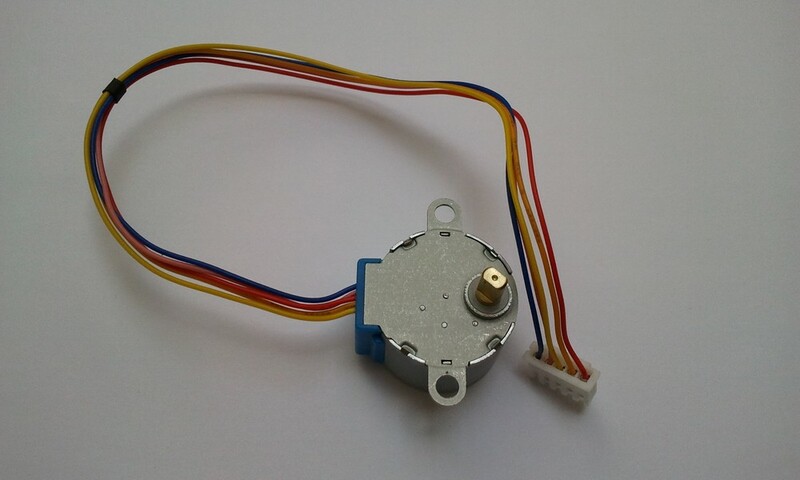 Most of cd-rom or dvd-rom drives has a bipolar stepper motor, this motor has two windings and each winding has 2 inputs which means that this type of motor has 4 wires. 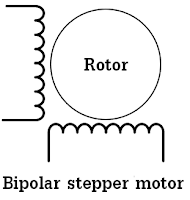 This topic shows circuit schematic and C code for controlling the bipolar stepper motor speed and direction using PIC18F4550 microcontroller. 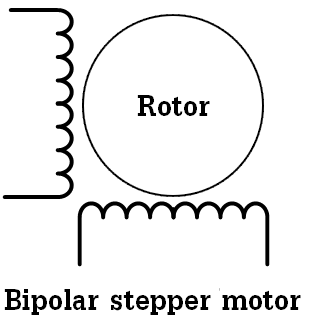 The stepper motor can be controlled in full step mode or half step mode. The full step mode is a little bit easier than the half step control mode. In this topic the full step control mode is used. The following image shows circuit schematic diagram of this project a potentiometer connected to AN0 channel is used to control the speed as well as the rotation direction of the stepper motor as shown in the video below. The following code is the full C code of this project where a potentiometer which is connected to channel AN0 is used to control the rotation direction and the speed of the stepper motor. The microcontroller reads the analog value from the output of the pot and uses the digital value to control the rotation direction and the speed with ADC resolution of 8 bits. The following video shows the project in hardware circuit. 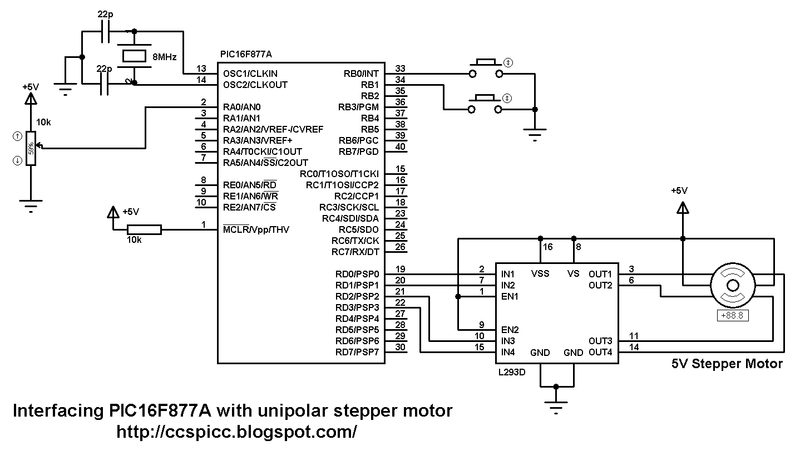 This topic shows circuit schematic and C code for controlling the bipolar stepper motor speed and direction using PIC16F877A microcontroller. The following image shows circuit schematic diagram of this project where two pushbuttons are used to choose motor rotation direction and a potentiometer to control motor speed. PortB internal pull-ups are enabled in the C code. A pot connected to AN0 is used to control the speed of the stepper motor. The microcontroller reads the analog data from AN0 and uses the digital value to change the delay between motor driving phases and when the delay increases the motor speed decreases and vise versa. The two pushbuttons which are connected to RB0 and RB1 are used to choose motor rotation direction and when RB0 button pressed the driving sequence follows the first table above and when RB1 button is pressed the driving sequence follows the second table. 8-bit ADC resolution is used. 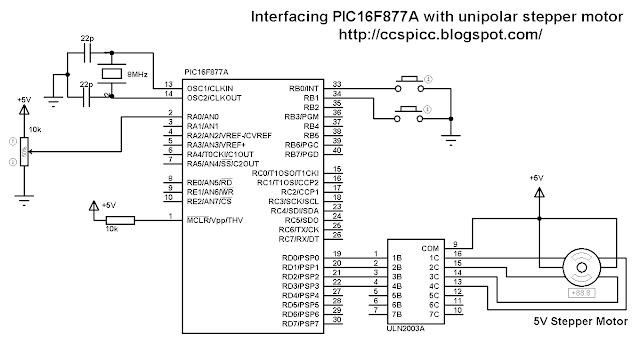 This topic shows how to interface PIC18F4550 microcontroller with DHT22 sensor with hardware circuit. 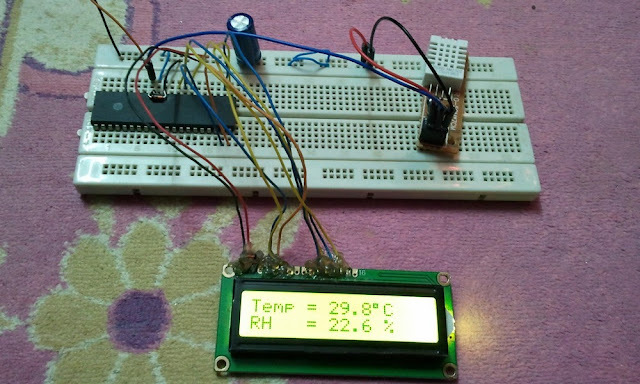 The following topic shows PIC18F4550 microcontroller and DHT22 Proteus simulation with some details about this sensor.